Michael Frye may be known as the 'Coloured Cactus' man by those of you who have only seen him in the "World's Top Photographers : Landscape" book but he has more than just a flashgun and some coloured gels to his name! He's worked in the Ansel Adam's gallery for many years and has produced what may be two of the definitive photography books on Yosemite. Although he does have an experimental urge occasionally, much of his output fits into the class 'sublime' American landscape work. He starts the book with the comparison between photographs and music, giving the advise that, just like a great song, a photograph needs to have tension and release, loud and quiet, low to high notes, etc. Just like in music, a sugary pop photo won't appeal for a long time but will get lots of airplay and the general public will like it on first listen. This idea of using the digital darkroom to produce a photograph in the same way as a song is produced is a good on, bringing out the best in a recording through finding what really makes a song/composition tick. Michael doesn't use photoshop in this book, probably realising that the majority of people can't afford a (legitimate) copy and instead bases his changes on lightroom, whose features in the most recent versions provide a great deal of control over photographic output. The first part of the book develops a workflow that you can apply to every photograph, a way of thinking that ensures you address the key aspects of post production. Each step in this workflow is then considered and great use of screenshots and sample photographs underly the advice given. The advice is always based on interpreting the picture, allowing the subject to guide the post processing. The main part of the book is dedicated to processing five different pictures from various parts of Yosemite and the Sierra Nevada. And this is where the best part of this book starts to appear. Being able to see how a professional 'interprets' pictures using tools available in Lightroom will be incredibly useful to beginners and professionals alike. Clarity, Saturation, Curves, Masking, Colour Temperature, Converting to Black and White, Toning, Cloning, Highlight Recovering - you'll learn a lot of the tools of Lightroom but not in a dry technical way but in a way that informs your future choices. There are also quite a few snippets of information throughout that the more advanced photographer can learn from. Is this book worth the $5 asked? Oh yes, very much so.. So go out and buy it now - support photographers that are doing a great job of disseminating knowledge. You can buy the book from Craft and Vision, David duChemin's eBook site. I believe it's also available as an iPad app! 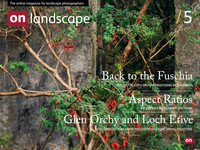 Read our other book review: Digital Landscape Photography - Michael Frye.